The New York City Police Department will deploy gun boats, as well as arm officers with “heavy weapons” in the week prior to the Super Bowl, efforts the department claims will “protect the public,” deter terrorists and prevent them from conducting reconnaissance. They also plan to use radiation detectors, canine teams and “heavily visible” Hercules foot patrols, along with closed-circuit TV cameras to thwart evil doers looking to rain on Super Bowl festivities. The heavy-handed show of force is in support of NYC’s Super Bowl Boulevard, a weeklong jumble of football related activities sponsored by GMC set to take place within a cordoned off 14-block expanse running along Broadway in Manhattan. 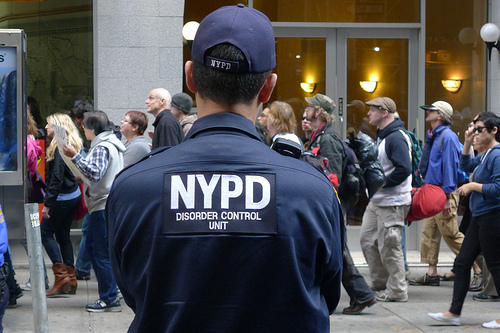 “As always the NYPD is taking a multilayered approach to protect the public at these events. Many of the technologies and procedures that we will be employing throughout this period are already being used throughout the city on a daily basis,” said Counterterrorism Bureau Inspector John O’Connell at a conference Tuesday, according to Bloomberg News. To be sure, backpacks and bags won’t be allowed inside MetLife Stadium, the site of Super Bowl XLVIII, unless they’re see-through. Earlier this year, the NFL implemented a “clear bag policy” banning fans from bringing backpacks and bags to stadiums, claiming the measure would “enhance public safety.” A “buffer area” of bag police, with the aim to prevent dangerous bags from entering the stadium, will also greet fans. Make no mistake, Super Bowl security paranoia will be cranked up to 11 during the February 2 event. Fans will not be allowed to tailgate or arrive at the stadium on foot. “You cannot walk to the Super Bowl. You can get your hotel to drop you off at one of the New Jersey Transit locations or get the shuttle to take you to a Fan Express location, but you cannot walk, the games’s committee CEO Al Kelly recently stated. Super Bowl patrons will also endure the standard TSA-style pat downs and airport-style metal detectors “in the name of safety,” and will also likely be under the watchful eye of DHS-trained employees ordered to “See Something, Say Something,” as was the case at Super Bowl XLV in Dallas. These are just the latest efforts by the moronic spectacle that is the NFL to acclimatize the public to accept the disintegration of privacy and the Fourth Amendment, a right guaranteeing Americans protections against unreasonable searches. However, given that a majority of Americans are more concerned with Miley Cyrus and football than preserving civil liberties, it’s no surprise the NFL has come this far in acclimating the public to accept slavery in return for football seats. Infowars and Alex Jones recently re-launched a boycott of the NFL after the franchise again demonstrated itself to be a political weapon of the establishment when it refused to run a mild ad for rifle and gun parts manufacturer Daniel Defense. Our previous boycott was in response to sportscaster Bob Costas, the NFL and NBC using their influence on national television to promote gun control.